Looking for a cheap alternative to the Sodastream’s flavor mixes? Kraft’s Crystal Light might be just the thing for you. It can add flavor to sparkling water through its multitude of packets that come in different flavors, allowing you to create refreshing and tasty drinks. Crystal Light is a low calorie, sugarless sweetener (5 calories per packet) meaning that you can enjoy your drinks guilt free. This drink sweetener has gotten great reviews on Amazon and other sites thanks to its affordability, lack of calories and taste. While you might dislike certain flavors, there’s so many that are available (Lemonade, Pomegranate, Strawberry, Peach, Orange, Punch) that you’ll surely find one that you love. If you’re not sure which to get, Amazon has some variety packs that come with multiple flavors and, once you’ve found a delicious flavor you love, you can buy it in bulk. 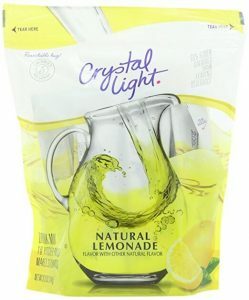 Each packet of Crystal Light can add flavor to up to 2 quarts (roughly 1.9L) of water and the packets pair well with sparkling water to make delicious soda-like drinks. 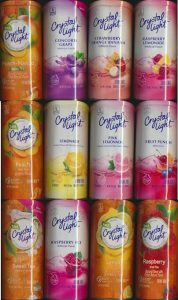 So if you’re looking for a delicious, healthy and affordable alternative to SodaStream mixes, Crystal Light is perfect for you. Stur is an all natural, sugar free, GMO free water enhancer with 0 calories. It comes in various flavors, mostly tropical inspired (Fruit Punch, Strawberry Watermelon, Blue & Blackberry, Orange Mango, Pomegranate Cranberry). 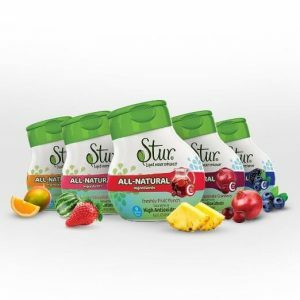 Based on stevia, a natural sweetener that is up to 150 times sweeter than sugar, Stur comes in small portable bottles that can each make up to 20 cups. 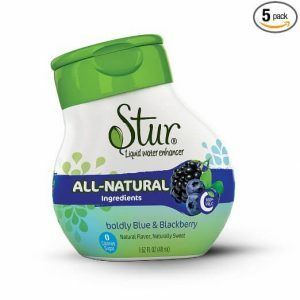 Stur has gotten rave reviews on Amazon as health conscious consumers love its flavor as well its healthy nature seeing that it is one of the rare all-natural and healthy options for flavoring your drink. Another benefit is the fact that it contains 100% of the daily amount of vitamin C you should be getting. However, it is more expensive than other alternatives. 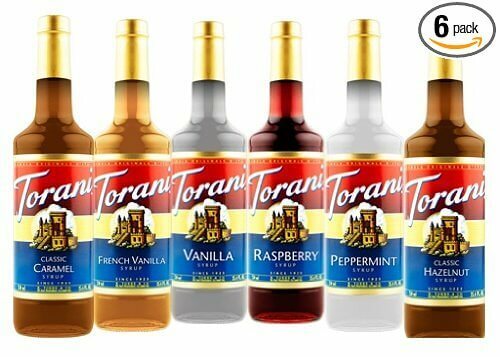 Torani is an American company with Italian origins that manufactures syrups and sauces. Due to it being a large company, they have an immense variety of different flavors that are available ranging from almond to bourbon caramel while passing by Irish Cream. They also have all your regular flavors (strawberry, lemonade, raspberry, etc.). Also, on their website, they have tons of delicious recipes you can choose from to make sodas or other drinks. Most of these recommend 1 oz of syrup for 8 oz of sparkling water and with each bottle retailing at a fairly hefty price, adding Torani to your sparkling water comes out to a higher cost per liter than other alternatives. While they do have some sugar-free variants, most syrups do have sugar. Nonetheless, the amazing taste of the recipes make Torani syrups more than a worthwhile option once in a while if you want a sublime guilty treat or if you want to seriously impress your guests. Get started with their variety pack on Amazon to begin experimenting with all their different recipes. Mio is another water enhancer brand owned by Kraft, albeit more modern than Crystal Light. It is sold in small portable bottles and it is a liquid. Their products have no calories and come in many flavors such as (berry pomegranate, strawberry, cherry). Each small bottle can add flavor to 5.6L of water and a 4 pack can be found at a decent price on Amazon which comes out to a relatively high cost per liter. Mio also has caffeinated versions, versions with electrolytes and versions with vitamin B. Also, overall, people love the taste so Mio is definitely a good option for those who want a caffeinated version of their drink or something with electrolytes/vitamins. Also, the bottle is easy to bring wherever you go. With its famous red mascot, Kool-Aid is another beverage mix made by Kraft. Even though it is marketed towards children, it is still a cheap and tasty way to add flavor to your carbonated water. It comes in a wide variety of flavors and a packet can make 2 quarts (1.9L). Since a 48 pack can be bought for cheap on Amazon, this option comes out to a significantly lower cost per liter than alternatives making it one of the cheapest alternatives to the SodaStream flavor mixes. It also calorie free which is great if you don’t want to drink too much sugar or if you want to avoid your child getting too much sugar while still giving him a tasty drink. While most people find it generally tasty, they do agree it tastes kind of artificial. This options is best for kids who will prefer the branding directed and children and won’t mind the artificial nature of the flavor. To help them find their favorite flavor, try out the variety pack. 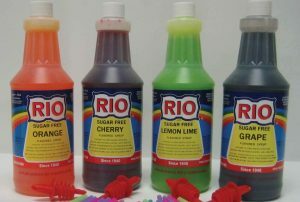 Rio syrup is an American company that manufactures syrups that can be used for snow cones or to make soda. It comes in several flavors. To make soda with Rio syrups, you must first buy the syrup concentrate. After, mix 4 ounces of concentrate with 5 pounds of sugar and enough water so that the whole mixture measures 1 gallon. After dissolving the sugar, you will be left with 1 gallon of syrup. To make soda, add 2 oz of syrup to 10 oz of sparkling water to make 12 oz of soda. Assuming you are buying your sugar at 60 cents/pound and since a 4 ounce bottle can be bought at a very low price, it comes out to a very low cost per liter, the cheapest among all mentioned alternatives. While this alternative isn’t particularly healthy, most users enjoy the flavors and it is an exceptionable deal considering the price. The last and simplest way to make great tasting drinks with your sparkling water is to simply mix it with orange juice. Combining the two with a 1:1 ratio (adjustable to your preferences) provides a delicious and healthier version of orange juice that isn’t overly sweet. Also, the added pep of the sparkling water makes it taste amazing. 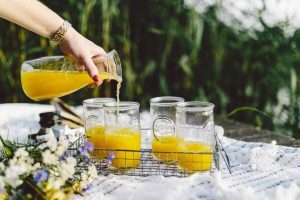 While fresh orange juice isn’t very cheap, mixing it with the sparkling water makes it cheaper in general since sparkling water is less expensive. I use Mio, but I have to use so much more in fizzy water than normal so it can taste good. The rio brand cola and ruby red grapefruit tastes good but the ginger ale is weak in flavor. I stopped buying rio brand because the shipping is expensive..Six 4 oz. bottles is over $15 dollars to ship to California..
After they expire, soda stream syrups take on a bitter chemical taste that seems dangerously unhealthy. As an alternative, in addition to Mio several companies make small bottles of liquid concentrates, including Kool-aid, Hawaiian Punch, Crystal Light and Orange Crush. Sometimes I get cravings for grape soda and I am pleased to be able to make Grape Crush at a moment’s notice. Dasani kiwi-strawberry is good too.